1. The myth of symmetry. We love to think of ourselves as symmetrical, but it turns out our left lung has two lobes and our right lung has three. That also means they have a different number of bronchial tubes feeding them. So when you’re thinking about inhaling into your lungs, you have five main pathways to visualize. And visualizing is important—as you trace the path of your breath into your body, you begin to get a sense of your internal self, both on a physical and on a metaphysical level, and awareness is the first step to healing. 2. Your neck muscles lift your chest. When you inhale, the muscles in the front of your neck (the scalenes and sternocleidomastoids, see image above) lift the collarbone and first and second ribs upward to make room for the upper part of the lung to expand. So it’s not your inhale that makes your chest rise and fall—it’s the muscles in your neck that move your ribs out of the way so air can be sucked into the lungs. This simple shift in perception and understanding completely changed how air was entering the top of my torso and allowed me to consciously relax my neck muscles on the exhale. 3. Your diaphragm is stronger on the right side than on the left. It’s one big muscle, but the right side of the diaphragm is stronger because it needs to do a little more work to push the dense liver out of the way to make space for your right lung. The left side of the diaphragm pushes on the stomach, which is a bit easier to move (unless it’s full!). To anchor this bigger right side, the diaphragm attaches to three vertebrae in the lower back (L1, L2, and L3), while the left side of the diaphragm is anchored to just two vertebrae (L1 and L2). And yes, that means trouble with the low back could affect the diaphragm and vice versa. 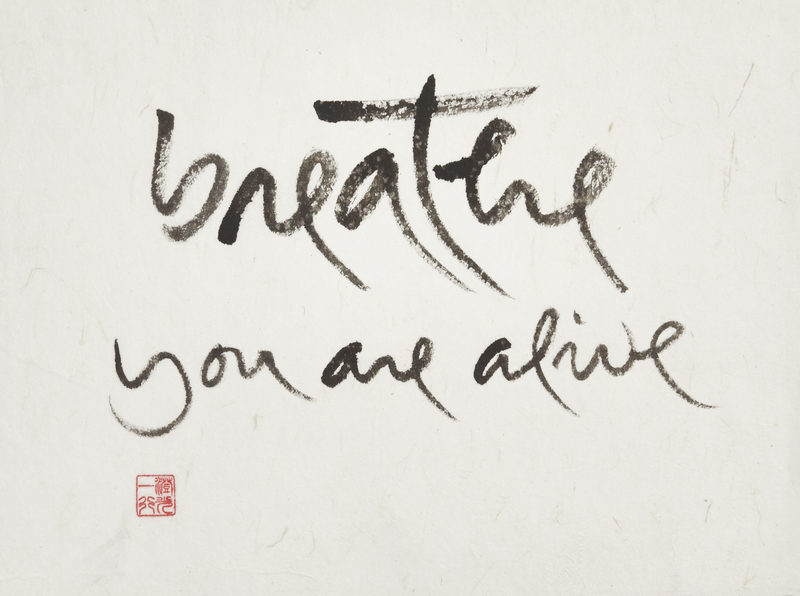 Try a Feldenkrais breathing lesson for yourself. 4. Working with the breath can release a muscle spasm. When a muscle spasms, it stays contracted and sends messages to your brain that there is danger. The contraction is attempting to prevent you from doing permanent damage to the muscle. You may want to dig your fingers in there and massage it out, but that can reinforce the idea it’s in danger and the muscle will simply keep sending a warning message to your brain, which will then keep the muscle contracted. So instead of stretching to lengthen the muscle, shorten the muscle by moving it in the same direction it’s already going as it contracts. Then work with the breath to help the muscle release. In my case, I discovered that my right sternocleidomastoid (that big, fat muscle that attaches behind your ear and comes down the front of your neck) was in spasm. Instead of tilting my head to the left to stretch the right side of my neck, I tilted it to the right (allowing the muscle to shorten as it was doing anyway) and consciously worked with my breath. This brought significant relief; the next morning I was 95% pain-free. A few hours at the computer (writing this post!) set me back a bit, but I have a better awareness of what’s going on now and can take steps to support healing. 5. Breathing is multi-dimensional. Our language is one of opposites. We breathe in and out, our chest goes up and down, and we inhale and exhale. But what happens in the body when we breathe is multi-dimensional—things expand in nearly every conceivable direction. Parts of the body move that we wouldn’t expect to move. The whole thing acts more like a jellyfish, a flowing movement that involves the whole organism. 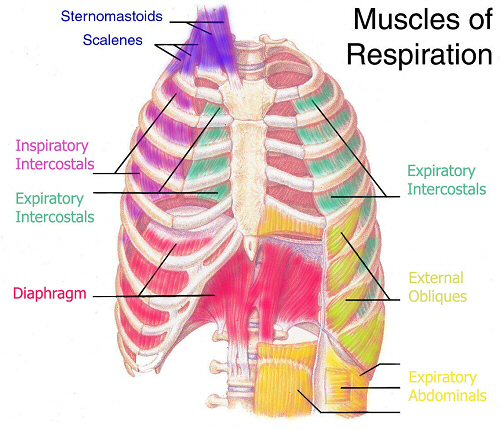 Even recognizing that the diaphragm moves down while the upper ribs move up can be a start to feeling the varying ways the breath moves the body. Paying attention to the parts of the body that don’t move—and inviting movement into those areas by figuring out what we can let go of to allow movement to happen—helps remind us our body is a whole, connected, intelligent system.